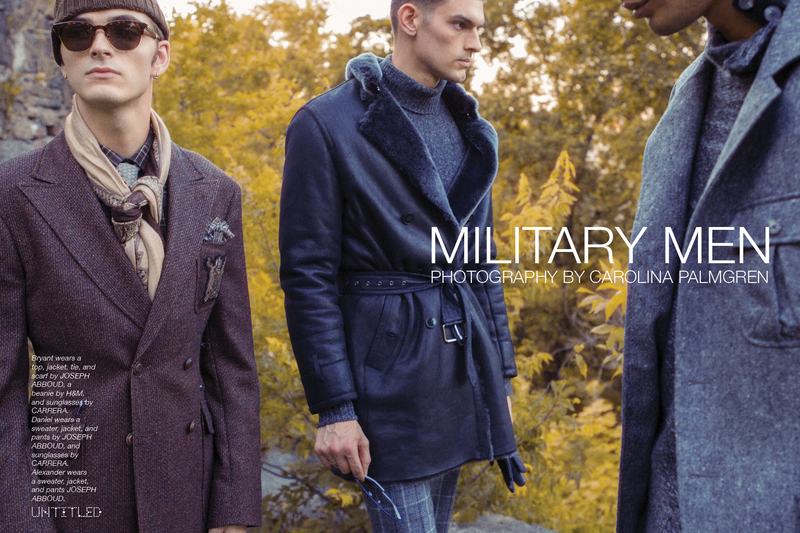 Military Men photographed by Carolina Palmgren for The Untitled Magazine, with styling by fashion editor Phillip Bloch. This page: Bryant wears a top, jacket, tie,and scarf by JOSEPH ABBOUD, a beanie by H&M, and sunglasses by CARRERA. 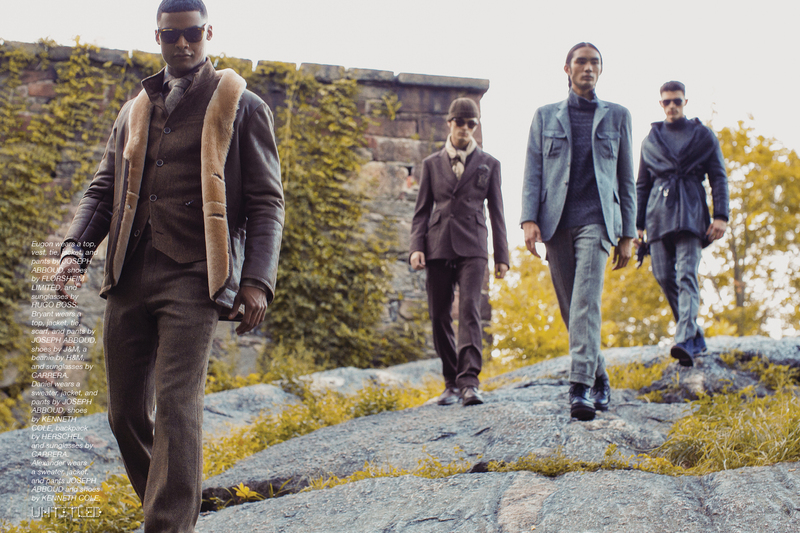 Daniel wears a sweater, jacket, and pants by JOSEPH ABBOUD, and sunglasses by CARRERA. 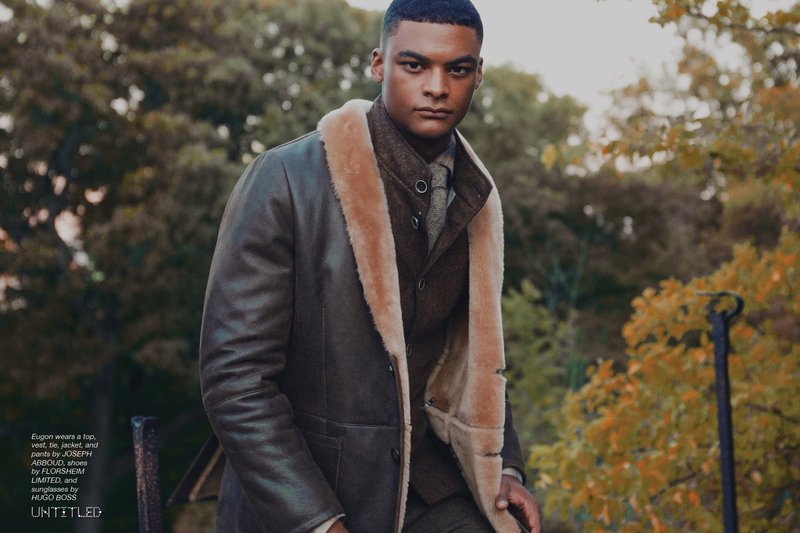 Alexander wears a sweater, jacket, and pants JOSEPH ABBOUD. 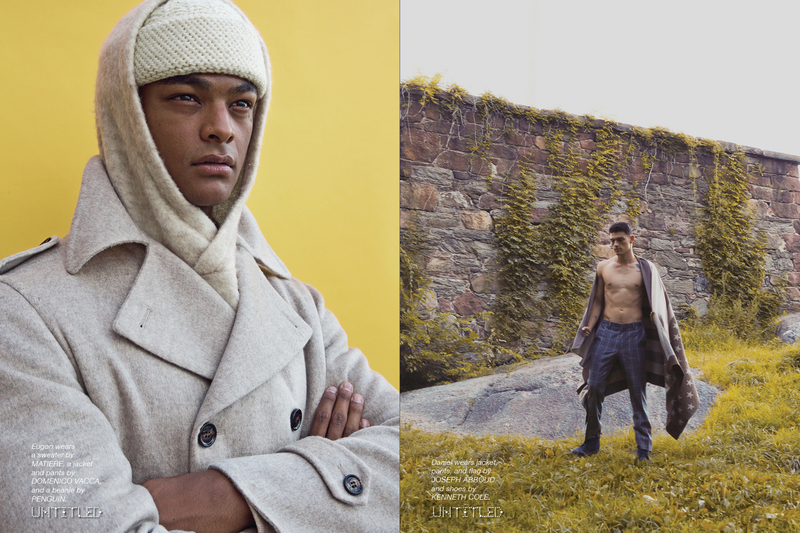 Left Page: Eugon wears a sweater by MATIERE, a jacket and pants by DOMENICO VACCA, and a beanie by ORIGINAL PENGUIN. Right Page: Daniel wears jacket, pants, and flag by JOSEPH ABBOUD and shoes by KENNETH COLE. Left Page: Alexander wears a shirt by ORIGINAL PENGUIN, a jacket and shoes by KENNETH COLE ,and pants by MAX N CHESTER. Bryant wears a top by MAX N CHESTER, a jacket by KENNETH COLE, pants by ORIGINAL PENGUIN, and shoes by FLORSHEIM. 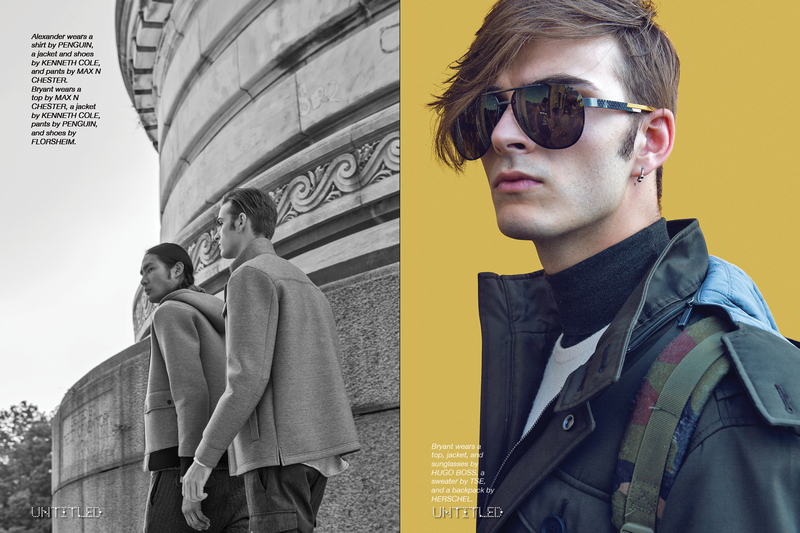 Right Page: Bryant wears a top, jacket, and sunglasses by HUGO BOSS, a sweater by TSE, and a backpack by HERSCHEL. Left Page: Eugon wears a jacket by JOHN VARVATOS, a scarf by HYDROGEN, pants by AMERICAN EAGLE, and shoes by J&M. Daniel wears a top by MARCELO BURLON, pants by KENNETH COLE, and a hat by KANGOL. 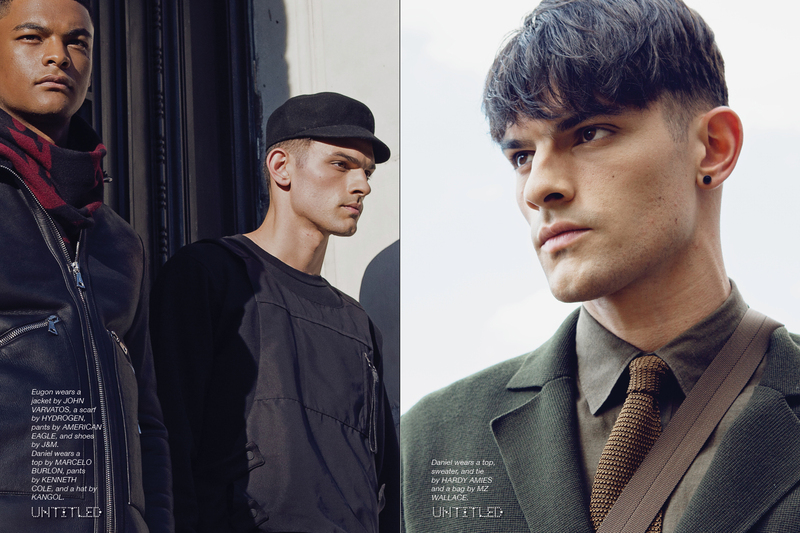 Right Page: Daniel wears a top, sweater, and tie by HARDY AMIES and a bag by MZ WALLACE. Left Page: Bryant wears a top by MAX N CHESTER, a jacket by KENNETH COLE, pants by ORIGINAL PENGUIN, and shoes by FLORSHEIM. Right Page: Alexander wears a sweater, jacket, and pants JOSEPH ABBOUD and shoes by KENNETH COLE. Eugon wears a top,vest, tie, jacket, and pants by JOSEPH ABBOUD, shoes by FLORSHEIM LIMITED, and sunglasses by HUGO BOSS. Left Page: Daniel wears a sweater, jacket, and pants by JOSEPH ABBOUD, shoes by KENNETH COLE, backpack by HERSCHEL, and sunglasses by CARRERA. Right Page: Alexander wears a jacket and tie by HARDY AMIES, a shirt by CLUB MONACO, pants by DOMENICO VACCA, and shoes by LOUIS LEEMAN. Daniel wears a top, sweater, and tie by HARDY AMIES, pants by HUGO BOSS, shoes by LOUIS LEEMAN, and a bag by MZ WALLACE.